The Puranas is a vast genre of Indian literature, which has the richest elements of Hindu culture. Choose a baby name inspired from Puranas to show your appreciation to these old literatures. Shiva the Destroyer or transformer of the Trimurti. Shiva also has Dasha-Sahasranamas (10,000 names). Here we give you a short list of baby names inspired by Shiva Names. Goddess Durga manifests fearlessness and patience, one who can redeem in situations of utmost distress. Here we give you a short list of baby names inspired by Goddess Durga. Vishnu, one of the main forms of God in Hinduism, mainly worshiped by Vaishnavas (followers of Vishnu). Few baby names inspired from Lord Vishnu. Goddess Parvati is a Goddess of love, devotion as well as divine strength and power. Each of her aspects is expressed with a different name. Here are few names of goddess Parvati. Krishna is avatara of Vishnu. Krishna is known by various names, which reflect his many associations and attributes. Here is a small set of Krishna names to make your choice easier. Browse our the ultimate collection of Vedic Names derived from 4 Vedas (the Rigveda, the Yajurveda, the Samaveda and the Atharvaveda.). Here we give you a short list of baby names inspired by Vedas. Indra is King of gods and Lord of Heaven. He is also a great warrior, a symbol of courage and strength. Here we give you a short list of names of Lord Indra. The Mahabharata is a major Sanskrit epics of ancient India. 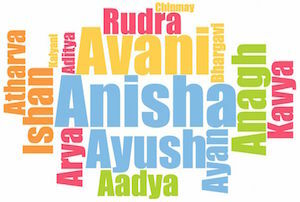 Here is a short list of baby names inspired by the Mahabharata to help you get started. The Ganesha Sahasranama is a main source of the names of Hindu deity Ganesha origenated from the Ganesa Purana. Each name conveys different meaning and symbolises different aspect of Ganesh. Here a small set of baby names inspired from Lord Ganesha, to begin your exploration. Lakshmi is Hindu goddess of wealth, prosperity, light, fortune,generosity and courage. Few names of Laxmi inspire from her incarnations or manifestations.